Translate your vision—clearly. Adhering to the policies and procedures that have made your business thrive is crucial to your franchisees' success—and to yours. An excellent operations manual makes all the difference. For your franchisees, your operations manual is the "bible"—the mother of all how-to guides, containing everything they need to know to successfully operate their new business. Thousands of our clients over the last 7 years have used our operations manual template to ensure consistency from one franchise to another and to protect their businesses' profitability and good name. Used by top franchise attorneys, franchise consultants, and hundreds of DIY franchisors, our template is best suited for service-industry and retail franchises. It features helpful "guidance boxes" that walk you through the process of making the manual entirely your own. 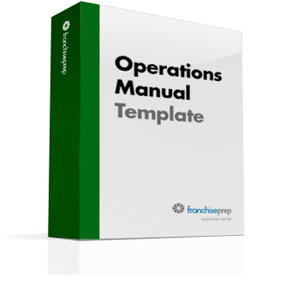 Franchise Operations Manual Template Sample - Chapter 8 Format and delivery Our operations manual template is a Microsoft® Word document that we make available to you for easy downloading immediately after you process your order. It's completely customizable and comes with thorough, easy-to-understand instructions and special "guidance boxes" that eliminate guesswork. Save $100. By upgrading to our Basic Package, you'll get our operations manual template plus all the other essential documents you need to launch your franchise at a savings of over $100 off the cost of buying these documents individually. Small businesses desiring to franchise their brand must incorporate certain documentation into their franchise package. The FTC regulates the Franchise Rule and stipulates in 14 US states that a franchisor must provide a franchisee with the Franchise Disclosure Document (FDD) at least 14 days prior to funds changing hands and the franchise agreement being signed. The FDD is part of the overall franchise package and includes an Operations Manual (s). The table of contents from the Operations Manual is included as an exhibit in the FDD. Depending on the size of the business the Operations Manual can contain 100 to over 300 pages and may take 400 to 1,000 hours to produce. The franchise package may include additional manuals to accommodate further details on the specific products and services offered. The compilation of documents contained in the Operations Manual include some of the key components to start and run the new franchise; to name a few: corporate contacts, business licensing, insurance and taxes, pre-opening procedures, products and or services offered, certain agreements, royalty distribution, training for the franchisee and employees, marketing for brand awareness and initial opening, employee policy and information, daily operating procedures, and much more. In addition to the lengthy documentation that must be included, every franchisor needs to establish ownership of their manual (s) and protect their brand. The franchisor or their legal representative needs to apply for the necessary proprietary service marks and include agreements such as a confidentiality agreement and a non-disclosure agreement (for the franchisee (s) and their employees and or subcontractors), in order to protect their brand. The Operations Manual is designed to protect the franchisor by including every detail of their business. The manual should be designed to include enough details with clear instructions on how to run the business and also protect the franchisor's investment by clearly stating what encompasses the brand. The brand can include the building design, products and or services, the logo, uniforms, store and fixture coloring, signs, suppliers, marketing materials, and any other detail that separates their business type from others. The Operations Manual not only serves as a reference guide to the franchisee by providing the initial guidance for starting the business, but it includes specific details on finding a suitable location, size and type of building for the operations. This can include further details on the lease requirements, business licensing requirements, insurance, and build-out, etc. The franchisor trains the franchisee on how to operate and run the business successfully, they share in proprietary details; such as the ingredients and suppliers used for a restaurant type franchise. The manual outlines the responsibility of the franchisee; when they operate, the products and or services offered, how to market using the brand, forms to use, employee training, daily operations, filing taxes and many other helpful documents specific to the business type. Professional consulting companies can charge upwards of $20,000 to $45,000 + to compile a manual suite depending on the size of the franchise and the products and or services offered. Certain small franchises running from a home office may not require significant start-up fees but they may also not get the same services. While it may be financially economical for some to try and write the manuals themselves, missing key documents designed to protect the brand could potentially leave the franchisor open to disagreements with the franchisee (s) and potential legal issues. Some franchise lawyers or franchise attorneys offer additional specialized services for businesses wanting to branch out, they can include services for: business franchising, taxes, and employee guidelines, etc. Whether a franchisor hires a consulting company to produce the initial manual suite, or they try to compile it themselves, protecting their investment should be the ultimate goal.